The Hospices de Beaune is a magnificent structure and Beaune’s major tourist attraction. The outside features a Burgundian and Flemish stone façade architecture topped with a steeply sloping roof tiled in diamond-shaped patterns of red, white, yellow and black. Inside the hall there is a lavish ceiling and walls lined with beds where for centuries the sick and elderly were interned. This was Beaune’s town hospital until 1971 when a new hospices opened on the outskirts of town. Today, part of the original hospices is still a geriatric nursing home. From its start, the Hospices de Beaune was the recipient of plots of vineyards donated by Burgundians. Since 1851, wines from these plots have been sold at the annual November auction providing funds to operate the Hospices. The prices resulting from the auction of wines from the estates of the Hospices de Beaune are a valuable guide to the market for Burgundy wines in general. There is a three day celebration surrounding the wine auction of Hospices de Beaune, titled Les Trois Glorieuses. This is one heck of a party with morning tastings followed by luncheons followed by afternoon tastings followed by dinner. The town of Beaune is outfitted for a continuous party weekend with street entertainers, food vendors, and plenty of wine. On Saturday evening dinner is at Clos de Vougeot, on Sunday dinner follows the auction at the Hospices de Beaune, and on Monday there is a luncheon in the village of Meursault called La Pauleé. Like the Hospices de Beaune, the Hospices of Sonoma is a three day affair. 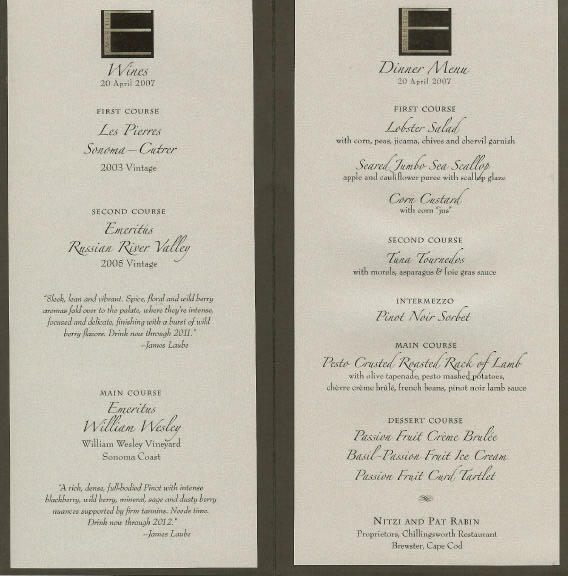 Friday night, April 20, featured multiple dinners at Sonoma wineries involving Chasseur. De Loach, Dutton Estate, Freeman , Kosta Browne, Halleck, Hartford Family Wines, J Vineyards & Winery, Lynmar Winery, Olivet Lane Winery, Paul Hobbs Wines, Schug Carneros Estate, and The Donum Estate. I attended the dinner and premier release party of Emeritus Vineyards (formerly goldridgepinot). Emeritus Vineyards is a new project spearheaded by Brice Cutrer Jones, the previous owner of Sonoma-Cutrer. Jones is a passionate Pinot Noir lover who is known in the Russian River Valley for his unending devotion to charity work. 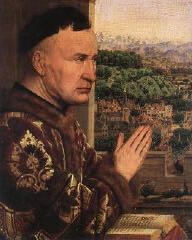 He was one of the founders of the Hospices de Sonoma. About ten years ago he purchased 180 acres along Highway 116 just two miles north of Sebastopol. This was the culmination of a five year search for a cool, well-drained hillside property. Located on the Gold Ridge which runs from Sebastopol through the company’s vineyard and continues eight miles further north to Forestville, the ridge gives its name to the soils of the area which are sandy and well-drained. 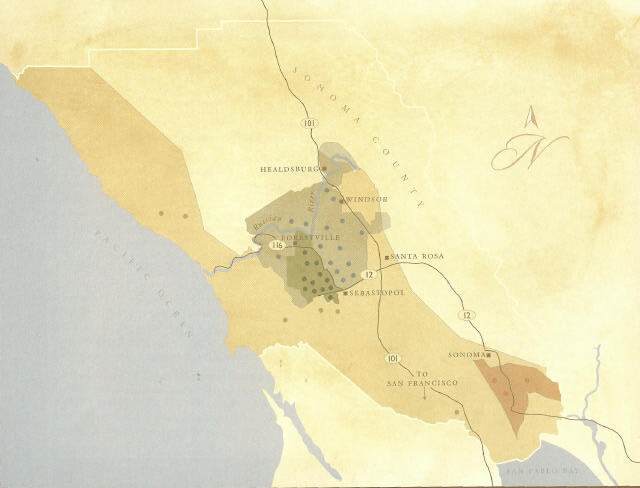 Some of the most prestigious Pinot Noirs in California are produced in this area (see map, page 3). 120 acres are planted primarily to Pinot Noir, including Pommard and Dijon clones 115, 777, and 828. The vineyard is oriented toward the southwest on gentle slopes, giving the vines optimum exposure. The densely-planted vines are kept cool during the day by the gentle breezes that flow from the Pacific Ocean during the summer, and then cooled at night by the fog which appears almost daily in the early morning. Sustainable and dry farming is practiced under the direction of viticulturalist Kirk Lokka to yield grapes that achieve full ripeness without excessive sugars and extracted flavors. Emeritus Vineyards also owns two small parcels in the true Sonoma coast near Annapolis at an elevation of 900 feet. Named the William Wesley Vineyard, this site offers a different flavor and texture expression of Pinot Noir than the home ranch vineyard. It was then time to savor the four course meal prepared by Nitzi and Pat Rabin, proprietors of the Chillingsworth Restaurant on Cape Cod, Massachusetts. Jones introduced Don Blackburn, the first winemaker at Emeritus Vineyards. Blackburn was trained and educated in France and has worked at several prominent French wineries. In California he has made wine at Byington, Elliston, Bernardus and David Bruce. Each year he travels to Burgundy with Jones to meet with coopers and find inspiration. 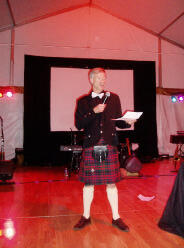 He delivered a prepared talk and rhapsodized about the glories of Pinot Noir, “the most pagan of varieties.” Delivered in his Scottish getup, it was quite a captivating scene. He also emphasized a few winemaking practices at Emeritus. Grapes are picked when they are fruity and floral, not overripe with jam and leather flavors. Harvest is in the early morning hours when the grapes are more turgid. Punch downs of the cap are down by human feet, considered the best way to appraise fermentation. Barrel aging is carried out in about 1/3 new French oak for 12 months. $32 · The aromatics are captivating, featuring Bing cherry, herbs, and roses. Complex flavors of cherries, wild strawberries, spice and cola are powerful yet demure leading to a mouth-coating finish. Superb in every way. $50 · Intense nose of earthy fruits leads to a well-structured wine brimming with wild berries and dark cherries. Raspberries arrive with a rush on an exceptionally long finish. Unresolved tannins indicate a wine for the long haul . Patience will be rewarded. I also tasted the 2006 Emeritus Vineyards Hospices of Sonoma Pinot Noir barrel sample crafted specifically for this year’s auction from the home ranch. Still young, it shows the same breeding as its older 2005 Russian River Valley sibling. Emeritus Vineyards Russian River Valley Pinot Noir is distributed by the Henry Wine Group in twelve states. The William Wesley Vineyard Pinot Noir will be sold through a mailing list. Sign upon the website at www.emeritusvineyards.com (still under construction). The winery and home vineyard are located at 2500 Gravenstein Hwy N. (116) in Sebastopol, CA 95472. The phone number is 707-823- 4464. Tasting and tours are available by appointment (kilts not required). The Hospices of Sonoma Barrel Auction was held on Saturday at Warren G. Dutton, Jr. Agricultural Pavilion, Shone Farm, in Forestville. In four short years, the event has become America’s largest Pinot Noir barrel auction. The WCC Charitable Foundation (WCCCF) manages the Hospices of Sonoma. Money raised in the first three auctions were used to build a permanent home to provide temporary housing for families of seriously ill children hospitalized in Santa Rosa (The Children’s Village of Sonoma County). This year funds raised from the auction were also earmarked for The Okizu Foundation, based in Novato, which provides services and support to families with children battling cancer, and Strikeouts for Troops, a charity founded by Cy Young award-winning pitcher Barry Zito that supports injured military service members and their families. The executive director of Hospices of Sonoma is Jane Hodges Young and the Grand Sponsor of the event is The Henry Wine Group. The event kicked off with a barrel tasting of 2006 Pinot Noirs from 38 acclaimed producers in the Russian River Valley, Green Valley, Sonoma Coast and Carneros (Sonoma only) appellations. Each of the winemakers offered a sample of their single barrel of Pinot Noir especially crafted for this auction and available nowhere else. For me, it was heaven, for I am an admitted Sonoma groupie. As I went from winemaker to winemaker, talking pinotspeak and sampling the sensual wines, I was reminded how blessed we are to have such dedicated, passionate, and talented people leading the charge. It was truly inspiring to see how freely these generous vintners gave of their wine and time to support the spirit of this charitable celebration. 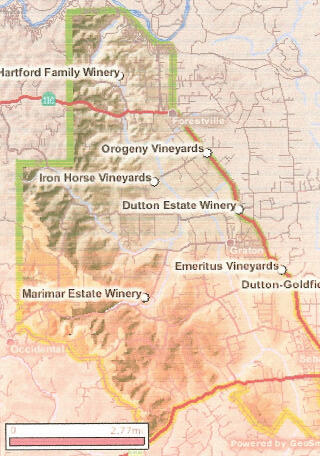 The location of the 38 participating wineries is pictured on the appellation map on the next page. Key: Tan - Sonoma Coast, Gray - Russian River Valley, Green - Green Valley Russian River (Green Valley lies in the southwestern corner of the larger Russian River Valley AVA and is the coolest and foggiest region within the Russian River Valley), Brown - Sonoma Carneros. The Pinot Noirs were auctioned in two 5-case lots (1/4 barrel) and winners of the first lot had the option of buying the second lot as well. Winners of the first lot also received a double magnum from the winery. 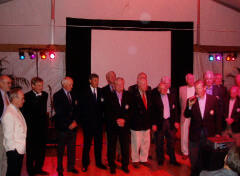 The auctioneer was Michael Davis, who along with his colleague Paul Hart, founded Davis & Company in 1993. In 2005, Michael and Paul teamed up with their old friend John Hart, to form Hart Davis Hart Wine Company. Hart Davis Hart has now emerged as one of the most trusted sources for fine wine in America. Last year’s Hospices of Sonoma Barrel Auction raised $350,000 and this year’s goal was $450,000. 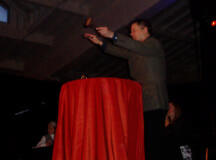 600 people attended the auction and bidding was animated. When the final lot was awarded and the final gavel struck, a total of $455,000 was raised. Quite an achievement considering tax deadline was the week prior. Kosta Browne brought the highest bid by far at $12,000 for 5 cases. Kosta Browne was founded in 1997 by Dan Kosta and Michael Browne and has quickly become the vanguard of the popular opulent and fruit-driven California style of Pinot Noir. Today, Dan & Michael produce seven different Pinot Noirs from the Santa Lucia Highlands, Sonoma Coast, and Russian River appellations. The Kosta Browne blend for the Hospices de Sonoma auction was a single-barrel of Wädenswil clone Pinot Noir from the Keefer Ranch in the Russian River Valley. Wädenswil is a town in Switzerland which is home to a viticulture research station. The UCD 2A selection of Wädenswil was imported into North American in the 1950s and, according to John Haeger, accounts for almost one-third of all Pinot Noir plantings in Oregon and less, but still significant, plantings, in California. It has often been used as a blending wine in Pinot Noirs, but is bottled separately by several wineries including Shea Wine Cellars, Talley Rincon Vineyard (all 2A), and J Nicole’s Vineyard (all 2A). I tasted the Kosta Browne barrel sample and found it to be fat on the palate with a creamy texture and ethereal finish. A real crowd pleaser. Other lots bringing high bids included Freeman ($7,500), Siduri ($7,500), Emeritus ($7,200), Rutz ($7,000), Davis Family ($6,500), De Loach ($6,500), Martinelli ($6,500), Patz & Hall ($6,500), and The Donum Estate ($6,500). Winners will receive their wines bottled with the distinctive Hospices of Sonoma label which includes a personalized cuvée name designated by the winning bidder. A Collector’s Lot was offered at the end of the auction which included 38 magnums, one from each producer in this year’s auction. Each bottle is to be etched and hand-painted with the special Hospices of Sonoma label. The winning bidder paid $18,000. As the auction progressed, a four-course dinner was served prepared by Park Avenue Catering Co., headed by chef Bruce Riezenman. The courses were perfectly paired with the multiple bottles of Pinot Noir on the tables. The “Individual Melt-Your-Heart Vella Jack Tart” was to die for. For more information and to keep apprised of next year’s event, visit the Hospices of Sonoma website at www.hospicesofsonoma.org. A report on this year’s event is posted at www.graperadio.com. Following is a list of the 38 producers at the Hospices de Sonoma Barrel Auction. I have not included tasting notes as the wines were one-of-a-kind and will not be offered for sale. Chasseur Bill Hunter fashions small lot Pinot Noirs from vineyards in the “West County Triangle,” the area between and around Sebastopol, Freestone and Occidental. The wines are largely sold through a mailing list at www.chasseurwines.com. Davis Family Vineyards A small producer of ultra-premium wines with fruit sourced from an estate vineyard in the Russian River Valley, other Northern California vineyards, and also vineyards in New Zealand (Gusto). 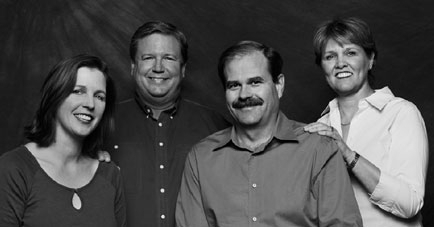 Davis Family Vineyards was founded in 1997 by Guy Davis. I find his Pinot Noir consistently excellent from vintage to vintage. There is winery, website, mailing list and retail availability. The quaint tasting room is near downtown Healdsburg. Www.daviswines.com. De Loach Vineyards Boisset acquired De Loach Vineyards in late 2003 and brought on Greg La Follette as winemaker. There is a renewed commitment to excellence here with the aim of producing ultra premium Pinot Noirs in Sonoma County. The Pinot Noirs are available on the website at www.deloachvineyards.com. The Donum Estate Anne Moller-Racke, viticulturist, and Kenneth Juhasz, winemaker, work together to produce one distinctive estate Pinot Noir from vineyards located on Ramal Road in the Carneros district of Sonoma County. In addition, an 11-acre Russian River Valley vineyard planted to Dijon clones 115 and 667 is farmed and a Pinot Noir has been produced from this source since 2005. The wines are available through both retail and website channels. Www.thedonumestate.com. Note: the winery also produces the Robert Stemmler line of wines. DuNah Vineyard & Winery DuNah Vineyard was planted in 1998 in the Russian River Valley south of Sebastopol. The winery produces 1,800 cases of an estate Pinot Noir and Chardonnay as well as one of each from outside vineyard grapes. The wines may be ordered online and through a mailing list at www.dunahvineyard.com. Dutton Estate Winery and Sebastopol Vineyards Owners Joe and Tracy Dutton can trace their roots in the Russian River Valley back to the 1920s. Tracy’s great-grandparents farmed apples in Sebastopol and now the family manages the renowned food and farm production facility, Kozlowski Farms. Joe is co-owner of Dutton Ranch which spans 1,150 acres of grapes and 150 acres of apples, all within the Russian River Valley and Sonoma Coast appellations. The winemaker is Mat Gustafson. The winery has a tasting room that is open daily on Green Valley Road in Sebastopol and the wines also can be ordered online at www.sebastopolvineyards.com. Dutton-Goldfield Winery This winery is a collaboration between Steve Dutton and Dan Goldfield. They shook hands in a vineyard in 1998 and embarked on a journey that has brought them considerable recognition and success. They source fruit from several prestigious vineyards. The barrel offered for auction came from the Freestone Hill Vineyard planted in the mid 1990s on the Sonoma Coast. The tasting room is in Santa Rosa. The wines are offered on the website, www.duttongoldfield.com. Emeritus Vineyards See write up on inaugural release party, pages 2-5. 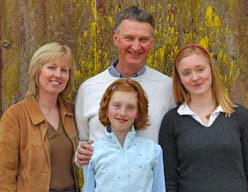 Failla Wines `Failla was started in 1998 by winemaker Ehren Jordan and his wife, Anne-Marie Failla. For many years Ehren made wine for both Neyers Vineyards and Turley Wine Cellars. Construction of a 4,000 square foot winery is underway at the winery’s location on Silverado Trail in the Napa Valley. The barrel offered for auction came from Block 4 of the famed Hirsch Vineyard (12-years old, Pommard clone). The wines are sold primarily through a mailing list at www.faillawines.com. Flowers Vineyard & Winery Joan and Walt Flowers are pioneering vintners who first planted Pinot Noir along the true Sonoma Coast before the region found its notoriety. The vineyards here compose 80 acres and are located less than two miles from the Pacific Ocean at elevations ranging from 1,350 to 1,850 feet. The vineyards are located in warm sites within the cool climate. A high-tech winery was completed in 1997. The winery has had several prominent winemakers and the wines have enjoyed well-deserved popularity. The Pinot Noirs and Chardonnays are sold through some retail channels and by a mailing list at www.flowerswinery.com. Foppiano Vineyards One of the wines I cut my teeth on when I become interested in the grape was Foppiano Petite Sirah. The Foppianos can date their history in Sonoma County to 1896 and have been growing Pinot Noir since 1970 in their vineyard in the Russian River Valley. The wines are widely distributed. A tasting room is open daily on Old Redwood Highway. The website is www.foppiano.com. Freeman Vineyards & Winery Ken and Akiko Freeman, together with noted winemaker Ed Kurtzman (Testerossa, August West), produce small-lot Pinot Noirs from Sonoma Coast and Russian River Valley vineyards. Their winery is housed in caves that have been lovingly restored near Sebastopol. The wines have limited retail distribution, with most of the production going to restaurants and a mailing list at www.freemanwinery.com. Tours and tasting are by appointment. Gary Farrell Vineyards & Winery Gary Farrell is a legend in the Russian River Valley whose winemaking career dates to 1978 when he was hired at Davis Bynum Winery. In 1982 he began his own label, producing 50 cases of Pinot Noir from the Rochioli and Allen Vineyards. Farrell has achieved success with multiple varietals, but his Pinot Noirs, crafted in an elegant and age worthy style, have received the most acclaim. The winery was sold to Beam Wine Estates several years ago. He recently announced that he is leaving his namesake winery to start another winery in the Russian River Valley. Pinot Noir will continue to made at the winery on Westside Road under his name but with the production direction of the corporate owners. The wines are widely distributed and also sold at the winery’s tasting room on Westside Road and online at www.garyfarrellwines.com. Gloria Ferrer Champagne Caves Gloria Ferrer was the first sparkling wine house in the Sonoma Carneros region (1984). The vineyard holdings are vast with the 207-acre Home Ranch Estate Vineyard planted to Chardonnay and Pinot Noir and the 128-acre Circle Bar Ranch Vineyard planted to Chardonnay, Pinot Noir, Merlot and Syrah. Vineyard manager Mike Crumly and winemaker Bob Iantosca have both worked for Gloria Ferrer since its inception. They have led three clonal trials in collaboration with University of California Davis along with studies on more than 40 different clones. The winery’s still wine program was begun in 1991. The sparkling wines are widely distributed while the still wines are sold primarily at the winery and through the website at www.gloriaferrer.com. Halleck Vineyard The Halleck Estate Vineyard is a one-acre family site in the Russian River Valley planted in 1992 to fund the college educations of the three Halleck sons. Several additional exceptional sites were identified and five additional wines were added to the roster. The barrel auction selection was from a two-acre site, The Farm Vineyard, farmed by noted viticulturist Jim Pratt. 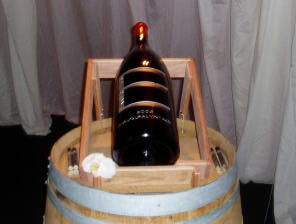 The Halleck wines are distributed to select fine wine retail stores, but the majority is sold directly to eager consumers through a mailing list at www.halleckvineyard.com. Hartford Family Winery This winery is tucked away in the Green Valley appellation in the town of Forestville and offers visitors an attractive tasting room experience. Founded in 1993 by Don and Jennifer Hartford, the winery sources grapes from special small vineyards in the Sonoma Coast, Green Valley, Carneros and Anderson Valley. Eight Pinot Noirs are produced. The wines are available retail and from the website at www.hartfordwines.com. Inman Family Wines Winegrower Kathleen Inman produces Pinot Gris and Pinot Noir from her Olivet Grange Vineyard, located off Olivet Road amidst some of the most notable vineyards in the Russian River Valley. Recently she has been sourcing grapes from Ted Klopp’s Thorn Ridge Ranch as well. She has shown a nice touch with both varietals and her wines have quickly achieved notoriety. Tasting is available by appointment at the winery’s Windsor premises. The wines are sold primarily through a mailing list and online at www.inmanfamilywines.com. Iron Horse Vineyards Iron Horse is well known for their sparkling wines, but they produce excellent still wines as well. The Sterling family owns and operates the winery located in Green Valley. The winery’s estate Thomas Road Vineyard is a distinguished source of Pinot Noir. The winemaker is David Munksgard and the winery chef is Christopher Greenwald who orchestrated a brunch for many of the auction attendees on Sunday. The Iron Horse wines are widely distributed and available on the website at www.ironhorsevineyards.com. A small tasting room is open daily and tours are available by appointment. 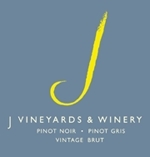 J Vineyards & Winery Judy Jordan founded J in 1986 to produce sparkling wines of distinction as well as still Pinot Gris and Pinot Noir. The winery’s vineyard holdings encompass 274 acres of diverse hillside, bench land and valley floor plantings. Winemaker George Bursick and viticulturalist John Erbe are transforming J with an emphasis on site-specific Pinot Noir. The winery has a beautiful tasting and hospitality center on Old Redwood Highway and offers wine-food pairings. The wines are in wide retail distribution and offered on the website at www.jwine.com. Kosta Browne See page 6. www.kostabrowne.com. Landmark Vineyards Landmark dates to 1989 when founder Damaris Deere Ford, a descendent of John Deere, purchased 20 acres in Sonoma Valley close to the town of Kenwood. In 1992, winemaker Eric Stern and consulting enologist Helen Turley developed a winemaking program that continues to this day. 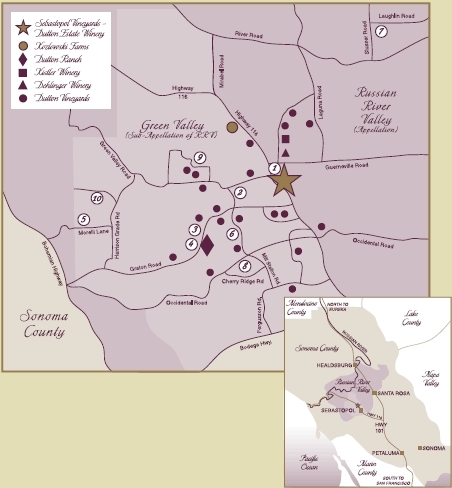 The Hospices de Sonoma offering came from Gap’s Crown Vineyard, farmed by Premier Pacific Vineyards and located on the western slopes of Sonoma Mountain. The winery produces outstanding Chardonnays as well, very reasonably priced considering the high quality. Landmark has a tasting room and a guest cottage available for rent. The website is www.landmarkwine.com. Lynmar Winery Lynn Fritz, an expert in global logistics and humanitarian relief efforts, and family, purchased Quail Hill Vineyard in the Russian River Valley in 1980. The winery was founded in 1990, and has been committed to producing world-class Pinot Noir and Chardonnay. The 42-acre Quail Hill Vineyard has recently been renovated and a new gravity-flow winery and caves have been built on the property. Winemaking is led by Hugh Chappelle who is a distinguished minimalistic vintner. The Quail Hill Vineyard provides the source of Lynmar Reserve and Quail Hill Cuvée wines and several regional vineyards are sourced for an upcoming vineyard-designate program. The wines are found in fine retail stores and on the website at www.lynmarwinery.com. The new hospitality center is striking and visitors enjoy the opportunity to sample small bites matched with Lynmar wines. MacMurray Ranch Fred MacMurray, one of Hollywood’s most beloved actors, purchased the MacMurray Ranch in 1941. Now owned by Gallo, Kate MacMurray, the daughter of Fred MacMurray and actress June Haver, continues to reside on the ranch. The two families share a sense of stewardship for this magnificent property and today only 450 of the ranch’s 1,500 acres is planted to vines. Susan Doyle is the winemaker who has shown a deft hand with Pinot Noir. The winery is not open to the public. The wines are distributed to better retail stores. 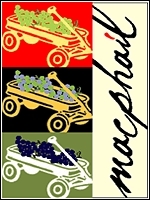 MacPhail Family Wines MacPhail was founded in 1998 with the purpose of handcrafting small lots of Pinot Noir from premier Sonoma and Mendocino County vineyards. Vineyard sources include Pratt, Sangiacomo, and Gooden in Sonoma, and Toulouse, Ferrington, Wightman House and Frattey Shams in Mendocino. The Pinot Noirs have quickly developed a cult following and are sold through a mailing list. The website is www.macphailwines.com. Martinelli Vineyards & Winery The Martinelli family has been farming in Sonoma County since 1860. The winery is famous for its Jackass Hill Zinfandel. The Jackass Hill Vineyard was planted by Giuseppe & Luisa Martinelli in 1899. All of the wines are produced from estate grown grapes which are farmed by Lee Martinelli Sr., and son, Lee, who carry on a five generation family farming legacy. The winemaker is Helen Turley and viticulturist is John Wetlaufer. The wines are sold through the winery’s quaint red barn-like tasting room on River Road in Windsor and to a loyal mailing list at www.martinelliwinery.com. Olivet Lane Vineyard (Pellegrini Family) The Olivet Lane Vineyard is one of the Russian River Valley’s heritage plantings, established by the Pellegrini Family in 1975. Distinguished producers including Williams Selyem, Merry Edwards and WesMar have crafted wondrous Pinot Noirs from this vineyard. The winemaker is Kevin Hamel. Robert Pellegrini chose a special barrel from the Olivet Lane Vineyard for the auction and the wine is to be hand bottled in magnums. The tasting room is housed in the winery’s Italianesque building just off Olivet Lane. The wines are well-distributed and also available for ordering online at www.pellegrinisonoma.com. Patz & Hall Wine Company This winery is unusual in that the principals include four individuals: James Hall and Anne Moses vinify the excellent Chardonnays and Pinot Noirs and Donald and Heather Patz look after sales and marketing. Almost 20 years old, Patz & Hall produces wines from distinctive vineyards in Napa Valley, Sonoma, Mendocino, and the Santa Lucia Highlands. Their hallmark is wines of power and finesse. A tasting salon is open in Napa which features food to accompany the wines. The wines may also be ordered online at www.patzhall.com. Paul Hobbs Wines After many years of making wine in Napa and Sonoma Counties as well as South America, Paul Hobbs has finally realized his dream of owning his own vineyard (Lindsay Vineyard) and winery in the Laguna Ridge area of the Russian River Valley. The inaugural 2005 vintage of estate Lindsay Vineyard Pinot Noir will be released soon. Paul Hobbs Wines are largely sold through a mailing list. 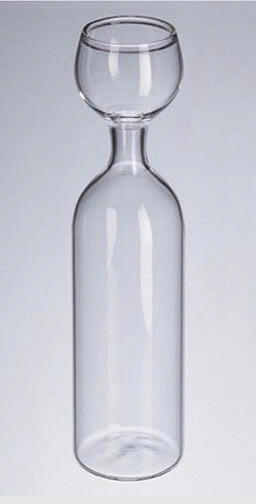 The website is www.paulhobbswinery.com. The new winery, on Gravenstein Highway (116) in Sebastopol is open by appointment. Radio-Coteau Eric Sussman, winegrower, works with cool climate coastal vineyard sites in Western Sonoma County and Anderson Valley to craft sensual Pinot Noirs and Syrahs. Sussman’s emphasis is on detailed viticulture combined with a non-interventionalist approach in the cellar. This label has quickly become a cult favorite and all of the wine is sold through a mailing list at www.radiocoteau.com. Russian Hill Estate Winery This is a family-owned and operated winery, established in 1997 by a husband and wife team of Edward Gomez and Ellen Mack (both doctors). Their nephew is Patrick Melley, the co-founder and winemaker. The winery and tasting room is perched on a hill in the heart of the Russian River Valley and has a magnificent view of the Russian River Valley. The winery was constructed with Pinot Noir in mind. Extra care is taken to prevent excessive tannin production or oxygen exposure thereby preserving the rich aromatics and elegance of Pinot Noir. The wines are sold online at www.russianhillwinery.com. Rutz Cellars Owner Keith Rutz crafts Pinot Noir in the style and flavor of the great Burgundies of Vosne-Romanee and Chambolle-Musigny. His unique winery is housed in a 5,000 square foot cave extending 300 feet into a hillside. His wines are available on the website at www.rutzcellars.com. Schug Carneros Estate Wine master Walter Schug celebrated his 50th year of winemaking with the 2003 vintage. Today, along with winemaker Michael Cox (see last issue of PinotFile on Mayro-Murdick Wines), who has been on board since 1995, Schug produces consistently satisfying Pinot Noirs from Sonoma Carneros. The wines have always been very fairly priced. The wines are available at the winery tasting salon, retail stores, and online at www.schugwinery.com. Siduri Winery Adam and Dianna Lee are celebrating over 12 years of excellence in winemaking at Siduri. Grapes are source from 27 different vineyards extending from the Santa Rita Hills in the south to the Willamette Valley in the north. The wines vary considerably in style and heft, reflecting the distinctiveness of the sites of origin. 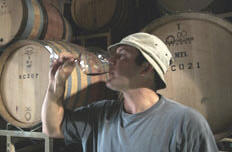 Ryan Zepaltas has been the assistant winemaker here for several years. The wines are sold primarily through a mailing list at www.siduri.com. 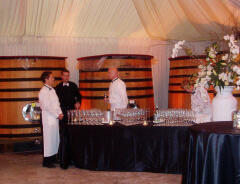 Tasting is by appointment at the winery located in a warehouse park at 980 Airway Court, Ste C, Santa Rosa, 707-578-3882. Sonoma Coast Vineyards John and Barbara Drady have used their many years of experience in the wine business to create a label that features a limited number of cool-climate varietals (Pinot Noir, Chardonnay, Sauvignon Blanc and Syrah) from select vineyards in the extreme Sonoma Coast. Their 2004 Pinot Noir was crafted from a selection of seven different clones harvested from seven different vineyards. The winemaker is Anthony Austin, now celebrating over 30 vintages as a winemaker in California. 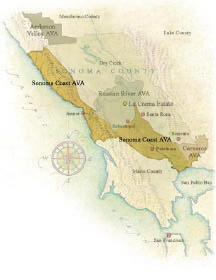 The wines are distributed through retail channels and also available online at www.sonomacoastvineyards.com. Tandem Winery Greg La Follette brings his impressive credentials to this winery he co-founded. Having trained under masters Tschelistcheff and Kongsgaard, he went on to star at Flowers and Hartford Court and has designed or redesigned 14 wineries worldwide. He produces six Pinot Noirs and four Chardonnays from notable vineyards in Sonoma with which he has long-term relationships (for example, Sangiacomo, Keefer, Ritchie). Tandem has a tasting room in the Plaza Farms Building in downtown Healdsburg. The website is www.tandemwinery.com. 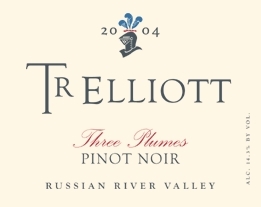 TR Elliott Ted Elliott honed his winemaking skills over several years at Sonoma-Cutrer. He now produces small, handcrafted lots of Russian River Valley Pinot Noir. He is also involved in the new Emeritus Vineyards project. His two Pinot Noirs are crafted from the Hallberg Vineyard and O’Connell Vineyard which lie along the rolling hills that stretch from Sebastopol to Forestville (the Cote d’Or of New World Pinot Noir). His wines are available in retail stores and on the website at www.elliottfamilycellars.com. Wild Hog Vineyard This is a small family-owned and operated winery and vineyard in the hills between Cazadero and Fort Ross on the Sonoma Coast. The owners, Daniel and Marion Schoenfeld, have been making wine since 1977 and opened the winery in 1990. The estate vineyard sits at 1,400 foot elevation five miles from the Pacific Ocean - a unique location that protects it from most of the summer fog. The wines are a secret shared by only the most knowledgeable pinotphiles who value the distinctive flavors that originate from the hostile environs of Wild Hog Creek. The wines are sold through a mailing list at www.wildhogvineyard.com. Robin Garr along with French Wine Explorers has arranged a special Terroirs of Burgundy tour enjoying VIP winery visits, comfortable accommodations, and gourmet Burgundian meals. Restaurants and accommodations have been chosen for their attractive quality-price ratio favoring the type of bistros and country inns that the French people themselves choose. The tour dates are July 2-7, 2007 and the tour is strictly limited to 16 participants. Highlights of the itinerary on day one include a tour and tasting at Domaine Bertagna in Nuits St. Georges, a guided tour of the ancient Clos de Vougeot Chateau with is massive 13th century wine presses, and a walking tour through the Grand Cru vineyards of Vosne-Romanee including Romanee-Conti and La Tache. On day two the group heads to the Maconnais where top producers will be visited including Domaine de la Bongran, Verget or Domaine Ferret. On the third day, the charming city of Beaune will be explored with a visit to the Hospices de Beaune. Wineries in Puligny and Chassagne-Montrachet, Meursault and Volnay targeting producers at the level of Bernard Morey will be included. On day four the sub regions of Burgundy will be visited including the Cote Chalonnais, Givry, Mercurey and Rully. Day five the group will return to the Cote de Nuits for additional visits to top producers. Plans are to meet up with Allen Meadows (aka Burghound) who will add his take on Burgundy over lunch one day. For more information or to make reservations, call 1-877-261-1500. You may contact Robin Garr at wine@wineloverspage.com to discuss this tour in more detail. Check the French Wine Explorers website at www.french-wine-tours.com for additional Burgundy tours and wine tasting barge cruises in Burgundy.